Once the plants were in the ground, we still had some work to do. My goal is to provide a lush garden that requires very little maintenance. And, with as many plants as we added, that means adding automatic irrigation and mulch. My Dad already had three spray irrigation zones in the front yard that he had used to water his former lawn. 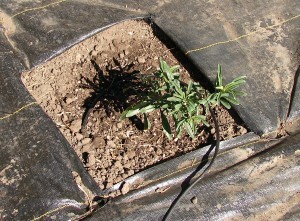 We kept one spray zone to water some of the existing plants that we left in place. The other zones we converted into two drip irrigation zones, one for the shade tolerant plants that went in the shadow of an existing maple tree and one for the sun-loving super drought tolerant plants. The in-line emitter method with 1/4" tubing with 1/2 gph emitters every 6". We ran 3/4″ Hardy Blue line piping in a closed loop from each valve then added drip emitters at each plant. We used two different methods to put the emitters at each plant. Method A: Punch the 1 gallon per hour (GPH) drip emitter directly into the 1/2″ drip main tubing. We did this wherever the main was located right up next to a plant. Method B: Where plants were located away from the main tubing, we ran 1/4″ spaghetti tubing from the main to the plant, then connected 2′ of in-line emitter tubing that has 1/2 gph emitters at 6″ o.c. 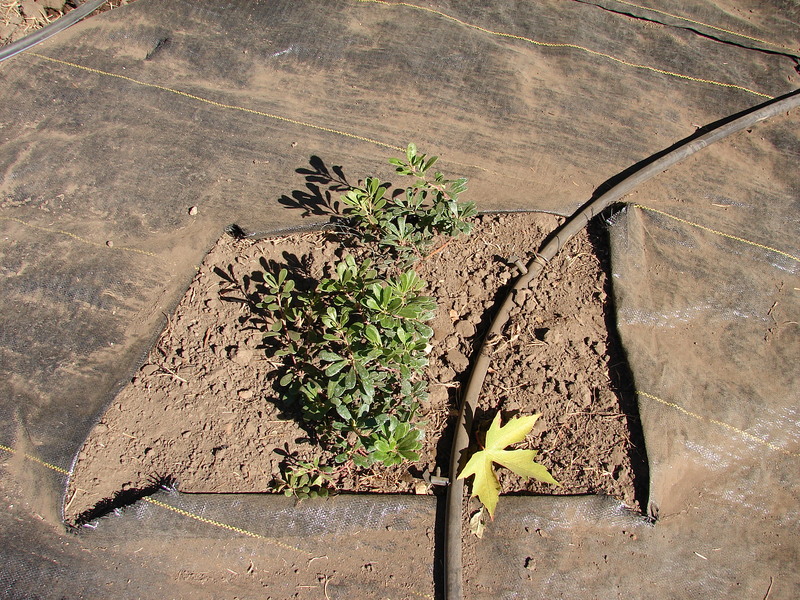 spacing (4 emitters per plant). The loose end of the tube gets a ‘goof plug.’ Both methods work well; you can pick either one or combine them in a single zone. 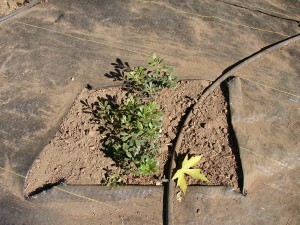 Once all of the plants had irrigation to them, we tested the system to make sure everything actually worked as planned. It did! A 4″ layer of mulch over the landscape fabric and irrigation tubing finished up the job. We ran both of the drip zones for a half hour that day. Then, we ran both zones every three to four days for the next couple of weeks. Because we did a major no-no, planting in the summer, we had to watch the plants closely and add more water than we would have if we’d have planted a month or two later. When temperatures shot up to the high nineties and then topped 100 for a couple of days, some of the new plants were stressed. I pruned back those that looked crispy and they are all now showing healthy new growth. These guys are tough. 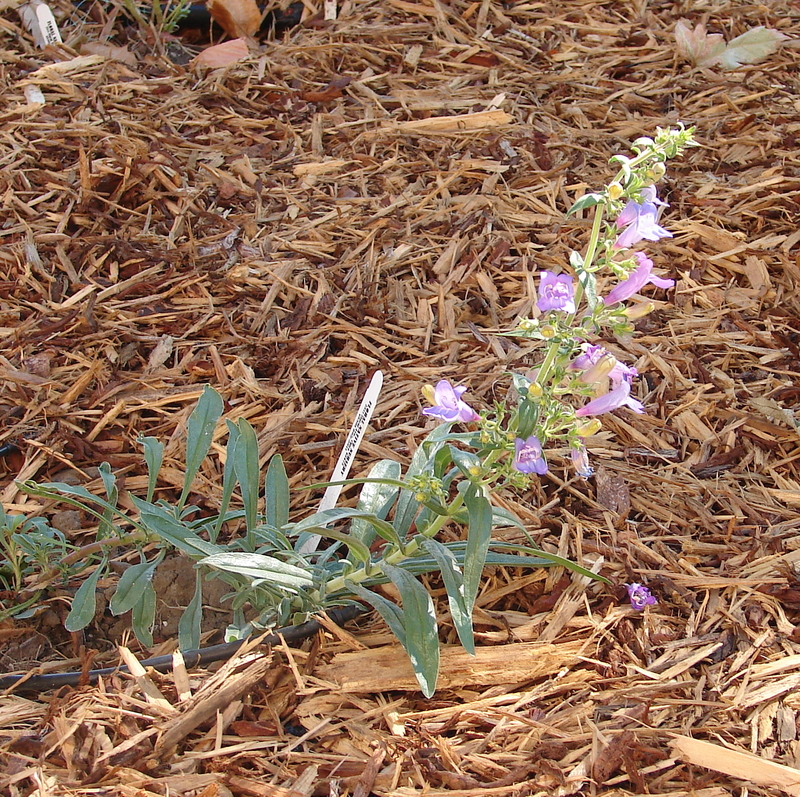 Foothill Penstemon two weeks after planting, in full bloom and growing. running the shade zone every 4 to 5 days and the sun zone once a week, both for 1/2 hour. Total water usage for the two zones is less than 100 gallons per week. Compare that to the 625 gallons per week that my Dad had to put on the former lawn. And, next summer, when the plants are fully established with nice big root systems, we’ll be watering the sun zone only once or twice a month and the shade zones about once a week. Amazing! 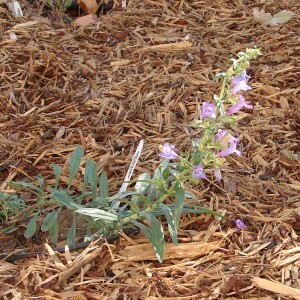 This entry was posted in New Projects and tagged adding drip irrigation, converting spray irrigation to drip irrigation, drip irrigation, drought tolerant plants, in-line emitter, low maintenance garden, minimal maintenance garden, shade tolerant plants, sun loving plants on September 30, 2010 by admin.